By all rules of the western genre, John Ford’s My Darling Clementine shouldn’t work. The plot, the primary motivations, and the action all but disappear for the whole middle part of the movie. And yet it’s one of the greatest westerns ever made. Ford’s westerns, at their best, danced along a thin line between reality and myth. The characters seem down-to-earth, and can surprise you with their all-too-human frailties and contradictions. But the atmosphere created by framing, lighting, and music suggests something bigger than the story of these people–the story of America..
Of all Ford’s westerns, Clementine gives us the greatest sense of myth. That’s hardly surprising, since it’s built around one of the west’s most famous legends–the shootout at the O.K. Corral. Yes, I know that it really happened. But the tall tales about this gunfight overtook actual history long before Ford rebuilt Tombstone in Monument Valley. And Ford and his screenwriters pretty much ignored history in their goal of creating an American myth. Ford never used Monument Valley as extensively and as effectively as he does here. Every daytime exterior in the film uses the Valley as its background. When you’ve got Wyatt Earp, Doc Holiday, and the Clantons on the streets of a Deadwood right smack in Monument Valley, you know that you’re watching a myth. The plot is simple. The Clantons rob Wyatt Earp’s cattle, and murder one of his brothers. So Wyatt (Henry Fonda), who was just passing through, becomes the town’s marshal, clearly without any ambitions beyond vengeance. All that is set up in the first 20 or so minutes. Then the film all but forgets about vengeance. Instead, it introduces us to Tombstone, pictured as a wide open western town inching its way towards proper civilization. And in that changing town, Wyatt Earp develops a complicated and not-always- cooperative friendship with Doc Holiday (Victor Mature). Holiday’s Mercurial, self-hating, and possibly suicidal personality makes it impossible to know when he’s with Wyatt, and when he’s against him. 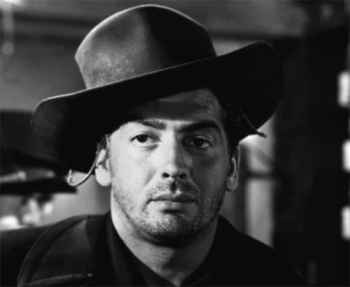 If you need any more proof that John Ford was a great director, consider this: He pulled a terrific, conflicted, and empathetic performance out of Victor Mature, a movie star known for being a bad actor. Even he would joke about it later in life. But here he even manages a slice of Hamlet’s "To be or not to be" soliloquy without it looking ridiculous. While praising the cast, I have to recognize Walter Brennan as the Clanton’s evil patriarch. This is one of the great villains in the movies–spiteful, angry, intelligent, and terrifying even to his own four sons. They’re as evil as he is, but considerably less intelligent. 23 years later, he played a comic variation of the same character in Support Your Local Sheriff. Alas, the female leads scarcely appear to be their own people. Cathy Downs as the titular Clementine, is little more than a symbol of civilized American womanhood. She’s the pure, perfect woman that Wyatt loves but can’t approach with anything but stiff politeness. And Linda Darnell’s Chihuahua, lovesick and full of larceny, would be a horrible Mexican stereotype if some dialog didn’t define her as Apache. That doesn’t help. The climatic gunfight is one of the best, with slow-building suspense before the bullets fly. My Darling Clementine was John Ford’s first film after he was mustered out of the navy after World War II. In it, he took one of America’s strongest myths and made it his own. Criterion has given up their policy of putting DVDs and Blu-rays in the same package. Now, you have to buy one or the other. 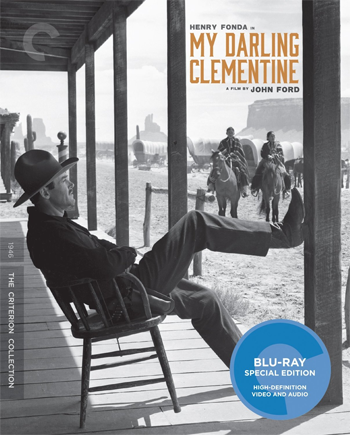 The Blu-ray version of My Darling Clementine comes in a simple plastic case. There’s one disc, and a small foldout rather than a full book. The foldout is dominated by an essay by David Jenkins, "The Great Beyond." As is standard for Criterion, the disc opens to the main menu the first time you insert it into a player. After that, it offers an option for Resume Playback. A timeline allows you to set bookmarks. 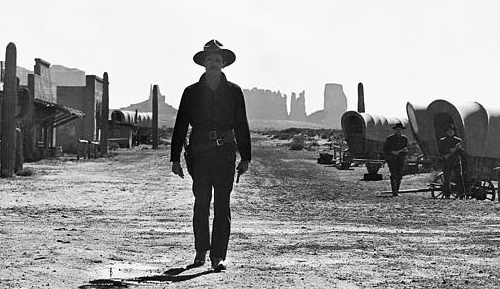 Like most films of its time, My Darling Clementine was shot in black and white, and in the Academy Ratio, 1.37×1. it’s one of the most visually striking films of its era. Fox and Criterion have done a wonderful job on this 4k restoration. Fine details, including stubble on men’s chins, are clearly visible. The grayscale is excellent, from near-whites to deep blacks, with fine shadow detail. The audio is PCM 2.0 mono. As such, it succeeds in producing the original sound as well as could be imagined. Like most Hollywood movies, My Darling Clementine was previewed and recut multiple times before its release in the final 97-minute version. One of those preview cuts, running 103 minutes, has survived. The Blu-ray offers this preview cut as a supplement. The disc also contains a 42-minute documentary, narrated by UCLA’s . Robert Gitt. Both cuts, plus the documentary, were on the original Fox DVD release. As Gitt reminds ups, this is "Not a director’s cut, but a work in progress." Both of these cuts were supervised by studio head Darryl Zanuck, and they’re almost certainly closer to each other than to Ford’s lost rough cut. Most of the differences are minor. A few scenes go on a little longer, and these are seldom the best scenes. One scene is visually identical, but with different music cues. Overall, I prefer the release version. But I wish that Zanuck had kept Ford’s original ending. Zanuck, in a memo, admitted regret for altering the ending for commercial reasons. Ford’s original ending, available now in the preview version, makes a big improvement. Although transferred in HD, the preview cut doesn’t get the full 4K-mastered, 1080p treatment of the release cut. It looks like broadcast HD, with that annoying video smoothness that movies shot on film are not supposed to have. Commentary by Ford biographer Joseph McBride. This is a new commentary; not the one on the original Fox DVD. McBride covers pretty much every issue about the film, from historical inaccuracy to how Chihuahua becomes idolized once she’s dying. He even explained a few things about the gunfight that had me confused. Print the Legend: 14 minutes, HD. New interview with western scholar Andrew C. Isenberg, author of Wyatt Earp: A Vigilante Life. He talks about the real Earp and Ford’s fiction. David Brinkley Journal: "tombstone": 8 minutes. A 1963 NBC-TV piece on Tombstone. Moderately interesting. Today: "Report on Monument Valley": 6 minutes. 1975 episode of NBC’s Today show. Talks about the location, the Navaho, and the movies. Doesn’t mention My Darling Clementine by name, but does mention the Tombstone set. Lost and Gone Forever: 18 minutes. Video essay by Tag Gallagher. Discusses Ford’s early friendship with Earp, the different cuts, music, framing. Makes a good argument that Ford’s wartime experience influenced the film and made it Ford’s darkest work. Bandit’s Wager: 14 minutes. 1916 western short starring and directed by Ford’s older brother, Francis Ford. John also plays a supporting role. I only figured out who is was by matter of subtraction; only three people in the movie. Not all that funny. Music by Donald Sosin. Lux Radio Theater: 58 minutes; audio only. I have to confess, I got only 12 minutes into this 1947 radio adaptation of the film. The Blu-ray is available now.